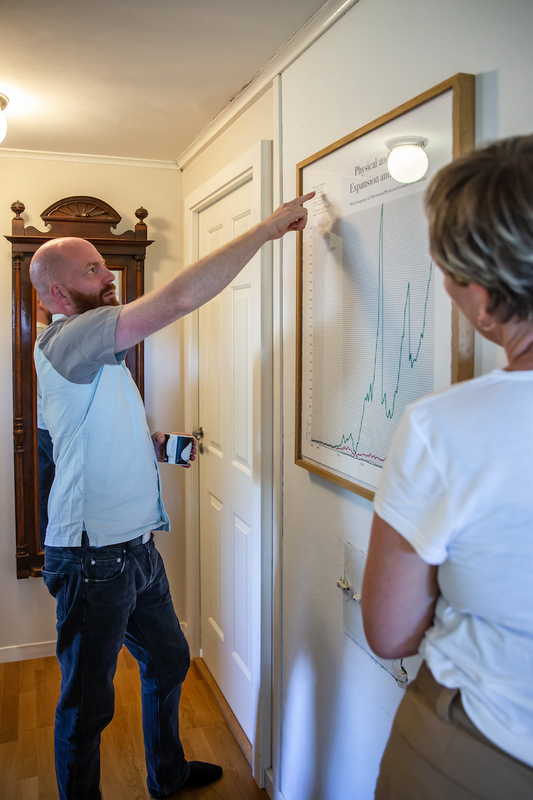 Art+Folk visited artists Kirsti van Hoegee and Tom Kosmo at their home in Bergen. The walls are full of art, mostly by local artists; interesting objects and small sculptures collect on shelves and window ledges. There is something to look at everywhere you turn and the space is light, airy and welcoming. We sit down with a cup of coffee to chat. A+F: Can you tell us a little about yourselves and your connection to Bergen? KVH: We met in ´96 and we lived in Oslo for a while. We came to Bergen to study at the art school. I started at the Photography department and Tom started at the printmaking department. TK: I come from the north of Norway, from Fauske. Both of us lived in Oslo for quite a few years before Bergen. We liked it here and things started to happen and we just stayed. A+F: How did each of you become an artist? How did your interest in art develop? TK: Art, creativity, where does it start becoming art? I did a lot of drawing and creative things since childhood. I was also a skateboarder, which I think was formative. A lot of creative people didn´t play football when they were younger, they were skateboarders. Maybe there are a lot of football people in the art world, but I think there is a connection. Skating is very creative, it´s about inventing new tricks and learning things then finding new variations. I guess it´s comparable to art in that sense. Around the time I met Kirsti, I started turning my creativity more towards art and thinking about education. I went to the school in Lofoten and we moved here in 2002 to start at KHiB. KVH: I moved up to Kabelvåg, I didn´t go to the school though, I started a darkroom in my house. I was working with photography but not considering it as an artistic practice. I had a dream of becoming a photo journalist but I couldn´t handle the ethics involved. We broke up for a while and I went to a school in Denmark, in Copenhagen for photography and that was my way into the art world. At the time, the photography department here was difficult to get in to. It was the only one in Norway. That´s why I choose Bergen art school, it was my first and only choice. A+F: So how was it to live as an artist in Copenhagen and other places? How does it compare with being an artist in Bergen? KVH: I´ve lived in Copenhagen and Lofoten, but in a way I´ve only worked as an artist in Bergen. I was in my own head in Copenhagen, I didn´t reach out to the art community there. I was just in the darkroom at school. So I don´t know how it is to live as an artist in Copenhagen. Since we have children, we haven´t travelled to artist residencies, except for 2 weeks in Svalbard. TK: While we were in Oslo we weren´t working in the sense we think about it now. We didn´t have any connection to the art scene. A+F: Do you both have studios, or do you work from home? Could you tell us how a typical day looks for you? Do you manage to separate your studio and free time? TK: We both have studios in the same floor in C. Sundtsgate at Kunstnerverkstedet. In the original studios there. KVH: I was at BLOKK before, I moved to the Kunstnerverkstedet in December. It wasn´t our dream situation to work in the same space as we have this tight family life that has always been separated from the artist life. But it works. I think we both manage to separate art and home life very well. In days with tight application deadlines there can be some writing at home, but normally we prefer to go back to the studio in the evening rather than to work at home. I have separated the photographs on my computers too, so at home there are only family photos and in the studio only work ones. I used to mix it more but now I will fix for example the Christmas pictures at home and not in the studio. 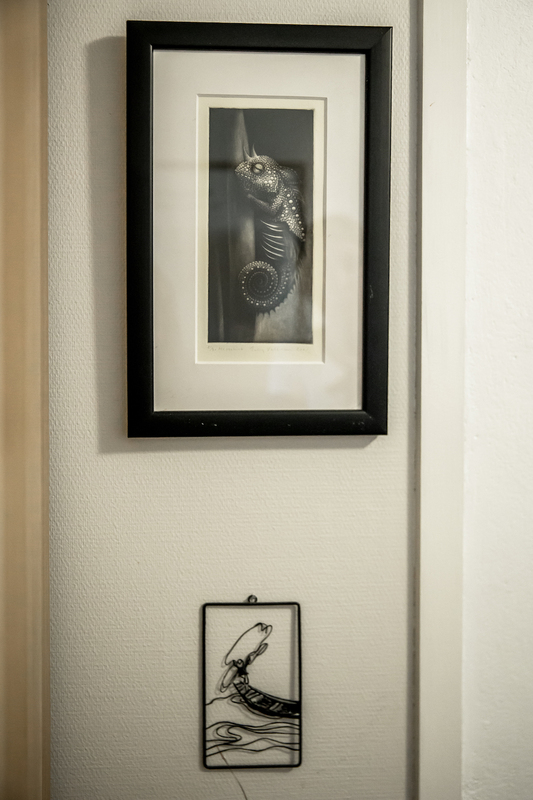 We have my oldest picture hanging in the bedroom, from my studies, but we don´t really have our own work at home. TK: We used to have more, but now that we have art from other artists, we prefer to have that hanging. I think it´s very annoying to have to look at my own work, I start to think about what I could improve. A+F: How often do you get into the studio? KVH: For me, I work 50% at KRAFT as a producer and curator, so that is 2-3 days a week. And I have the same at the studio 2-3 days a week. TK: I´m a full-time artist and I am very rigid about working hours so I am there every day. Almost 9-5 and some nights and weekends too. I don´t just do art, I do some stuff for money, framing and woodworking. I produce different types of things for other artists, mainly framing but also transport crates and exhibition solutions like plinths. I have a lot of different processes, I do large scale paintings and print making. I also do some wooden sculptures, drawings. They are all in different parts of the studio. I am definitely a studio person, I spend a lot of time there. It´s very practical in many ways. I have this philosophy that I can produce everything I need myself, and I recycle materials. That´s a big part of who I am as an artist. A+F: You have a home full of art here, tell me a bit about the artworks you have from other artists. How do you come to own these pieces? Do you exchange work with other artists and/or do you also buy art? How do you choose the art you live with? KVH: There has been a lot of coincidence involved. We don´t always like the same things so I have bought some works and Tom has bought some and we have exchanged a lot with other artists. I arranged an art auction some years ago, Kunstauksjon SYRIA, together with VISP. I was in Bergen arranging it and Tom was in Oslo, and we both had a list of works we wanted to buy. But we didn´t manage to communicate well and we ended up buying more than we planned. So that was a boost to the collection! We inherited some money several years ago, and we decided to use some of it on art. Ornament and part of a photograph by Azar Alsharif. TK: Without the inheritance we could not have done it. We had some art before but not much, at least regarding original works. I have a lot of prints, more than we have hanging here. That´s all from exchanging with other artists. KVH: We talk about our responsibility to buy works from other artists. We think we should be part of the artistic economy. When we had the money we spent it quickly because there were so many artworks we wanted. We buy with our hearts really. We know the artists we buy from and we want to support them. It´s also an investment for our children. We don´t have a lot of money but they will inherit the artworks. TK: I think there is an obligation to invest in local art when you can. We expect people that we don´t know to invest in what we make but artists don´t invest in the local arts because we never have the money. So when we have the opportunity, if we do it, otherwise who else will? A+F: Do you normally get works directly from the artists or do you also buy from galleries? KVH: We got a lot from the auction, we also exchange works. TK: Mostly from artists directly but we have bought a few works from galleries, a painting, some prints. We have all sorts of stuff, also from antique shops. A+F: Do you have a wish list of works that you would like to collect in the future? TK: I do quite a bit of framing for other artists and often I would like to acquire some of their pieces as I get a relationship to the work. I´m framing Kyoshi´s work now and I would like some of that. There are lots of works I would like from both local and international artists, there are a lot of artists I admire, but its not going to happen. Maybe if some miracle occurs in the future. KVH: I don´t have anyone I follow specifically at the moment. A+F: What are you working on now? What projects and exhibitions do you have coming up? KVH: I´m working on a group show in Kristiansand Kunsthall, with a book I made in 2017. I´m doing a remix of the book, a multimedia installation. My daughter is reading the texts and an algorithm will randomly mix the texts and images together. 16 art projects will be exhibited, around the theme of words and language. The exhibition will be up 22nd September – 23rd December. Images of work by Kirsti van Hoegee, courtesy the artist. TK: I´m doing a solo show at Oseana Kunst- og Kulturhus in Os, it opens 10th November. In addition, I will participate in a group show at Hå Gamle Prestegård called "Parabiose". The term is Greek and means "living beside", as the opposite meaning of symbiosis. The underlying theme of the show is the coexistence between humans and other life forms. Images of work by Tom Kosmo, courtesy the artist.